4 June 2018 — Mammal – one of Australia’s most fierce, outspoken & storied rock artists, shook off the hibernation sickness of their hiatus in late 2017 to make a ferociously triumphant return to the Australian live music scene. May 2018 saw them release their first music and video in 8 years, a dance-able track called Community – and announced that they would once again head around the country. 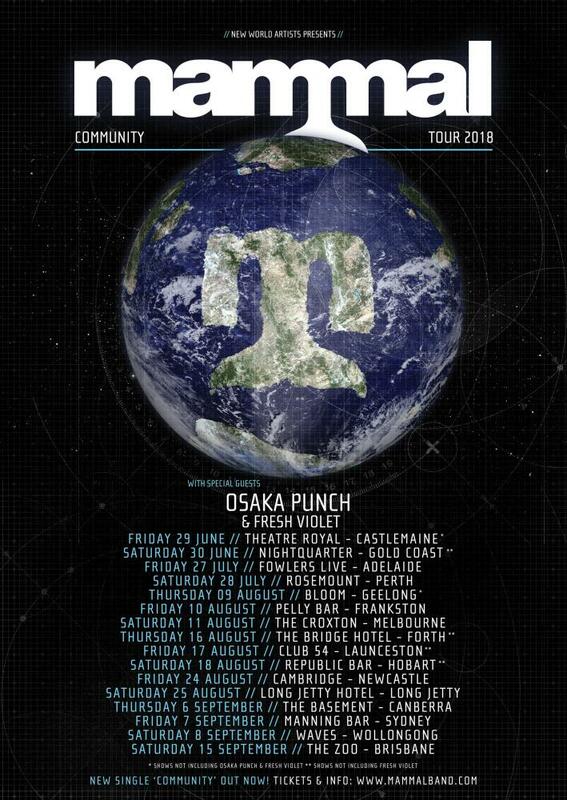 Now – they are adding to that legacy with new track ‘Virtue Signalling’ and adding even more dates to their already packed tour schedule. Mammal fans will have ample chances to see the outspoken and in-your-face act from June through September 2018. Their live show in Melbourne at the end of 2017 sold out within hours of tickets being released and needless to say went on to be one of the most intense and emotionally charged shows in the bands short, but action packed history. They quickly added 3 more shows in late 2017 with each one proving to be just as powerful, affecting and exciting as ever. Mammal and their tour presenting partners, New World Artists, have added a glut of new shows on to the tour, adding Long Jetty Hotel in Long Jetty on August 25th, Manning Bar in Sydney on September 7th, Waves in Wollongong on September 8th and The Zoo in Brisbane on September 15th! Singles ‘Community’ and ‘Virtue Signalling’ were both self-produced by Mammal and recorded in Melbourne by engineers Tyson Fish and Steven Smith and mixed/mastered by legendary producer Machine (Lamb of God, Clutch etc) at the Machine Shop in the USA. ‘Virtue Signalling’, is one many fans from the return shows may remember – it made its debut in the live set during that tour. The track is Classic Mammal – Bouncy riffs, spitfire lyrics and all the intensity and ferocity you’ve come to expect! Virtue Signalling is available from iTunes and Spotify from now and Tickets for the Mammal ‘Community’ Tour are on sale now at mammalband.com. Tickets for the additional shows on the tour will go on Fan Pre-Sale on Tuesday 12th June at mammalband.com (sign up to the Mammal mailing list!) and on General Sale Thursday 14th June at mammalband.com and mammal.oztix.com.au. Tickets on sale Monday May 7th – Ticket details at mammalband.com and mammal.oztix.com.au.